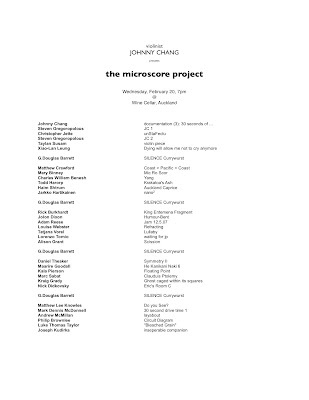 I got an email today from Johnny Chang and it turns out that he performed a 30 second composition of mine. Thanks Johnny! It appears that this concert happened in Auckland, New Zealand at the Wine Cellar. You can read more on his blog I believe this is my first New Zealand performance. Here is the recording, the program and the score. I was just watching a video about AV on the New Music Jukebox site and there was some footage of R. Luke DuBois. He speaks about people making sound art and not calling it music so as to avoid the baggage that is associated with music. He goes on to talk about how this negates Cages legacy of expanding music. That may be, I might add that there are countless others who have expanded music and Cage is the most notable American and probably the most recent expander. That is not really what I want to get at though. It occurs to me that "avant garde" music and the entire culture, which one could relate punk to (who was first the punk or avant garde? is an academic debate), is a culture of assertiveness. I suppose that I could say that a major component of the aesthetic is that of confrontation. This obviously has a negative connotation (confrontation), which can come off as something that you would, "not take home to mom". But I think it is just that notion of mom and apple pie and that the whole world is fine (think Prozac here) that avante garde and punk art forces us to confront. That's right Mary, little Tommy, the boy next store is pissed off and no amount of Prozac, Ritalin or pot is going to cure that. Rather, it is part of the human condition, we all are waiting to die and some people take the anger that is associated with that and amplify and draw on it. This is not to say that it is solely anger that defines this aesthetic point (the avant garde), but it is certainly a strong element in the proverbial mix. Isn't it interesting that spell check wants "Prozac and Ritalin" capitalized, but it does not recognize avante garde? 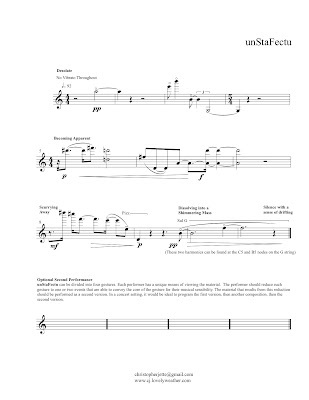 Next week there is there will be the premier of my new 4 channel diffusion and processing of live trombone composition (played by Mark Broshchinsky) here at UCSB. Should be great fun! THURS., MAY 15, 7 p.m. Sponsored by the Corwin Chair Concert Series. Mark Broschinsky, trombonist, has been recognized as a "true virtuoso on the instrument" and has appeared with numerous renowned orchestras. He will present thought provoking works from the last 50 years by Berio, Stockhausen, Folke Rabe, and graduate student Christopher Jette.